I completed my BSc (Hons) with a major in geology at the University of Western Australia in 2006. 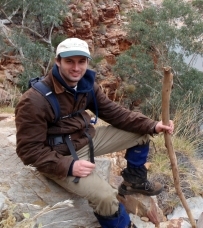 After graduation, I worked as an exploration geologist for a junior mining company in the Pilbara region for three years before commencing a PhD at Macquarie University in 2010. My PhD investigated the nature, abundance and mobility of gold in the upper mantle. This research focused on in situ analysis of sulfide grains in upper mantle peridotites, and found that gold was very heterogeneous as a result of its mobility in fluids. These results are important for understanding sulfide metasomatism in the upper mantle, and the role that process plays in the ore formation process. This has important implications for understanding the fluid flux within the lithospheric mantle. I completed my thesis in 2013, and presented some of the results at the Goldschmidt Conference in August that same year. After completing my PhD, I was employed by Macquarie University as an associate lecturer and an early career researcher. In late 2015, I commenced working as a Lecturer at the University of New England. Here, I am teaching a range of subjects dealing with mineralogy, petrography, geochemistry and field geology. Saunders, J. E., et al. (2016). "Gold in the mantle: The role of pyroxenites." Lithos 244: 205-217. Saunders, J. E., et al. (2015). "Sulfide metasomatism and the mobility of gold in the lithospheric mantle." Chemical Geology 410: 149-161. Saunders, J. E., et al. (2013). Mobility of Au in the mantle. Goldschmidt Conference. Florence, Italy, Mineralogical Magazine. 77: 2140. Saunders, J. E., et al. (2012). Gold mobility in the mantle: Constraints from sulfides in variably metasomatised peridotites. 34th International Geological Congress. Brisbane, Australia. Saunders, J. E., et al. (2011). Gold mobility in the mantle: Constraints from sulfides in pyroxenites and peridotites Goldschmidt Conference. Prague, Czech Republic, Mineralogical Magazine. 75: 1802.